Well, we've come to the 6-month mark for DC's New 52, and as we can see from this post, opinions are mixed at best! This month I've decided to add a little something to my columns...for all of the issue #6's I'll be showcasing this month, I've also added an overall assessment including some pros and cons, and a completely arbitrary rating out of 5! Exciting, right? As always, don't take it too seriously....I'm having fun and I hope you are too! First off this month, rather shockingly, is the Green Arrow!! 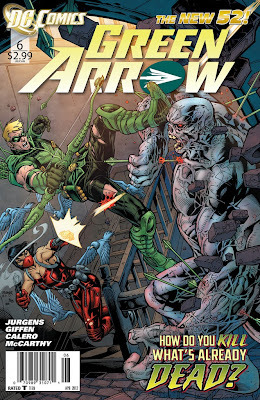 Green Arrow #6 - Well, the last book from the old creative team for Green Arrow is out, albeit minus the original penciller, and it's strangely my favourite issue yet! This achievement comes once more on the backs of two recurring characters I enjoy far more than old Oliver Queen - Blood Rose and Midas! In this issue we learn a little more about their origin and connection to the Archer, as well as a shocking surprise! I won't give away any more, but if you liked the first part of the story, you'll like this one too. So Green Arrow was one of the books I was considering dropping at issue 4...now I guess I better give the NEW creative team at least a few books. Doesn't hurt that it comes out on a week when only 2 other comics I buy appear...If only I could drum up more enthusiasm for a hero with a bow and arrow...I prefer my heroes to dress up like bats and shout at everybody! Don't they know? - The actual business of crime-fighting for Green Arrow is pretty dull, especially the first 4 issues. Score: 2 out of 5 bull's eyes...need more practice! As always, more after the jump!!! 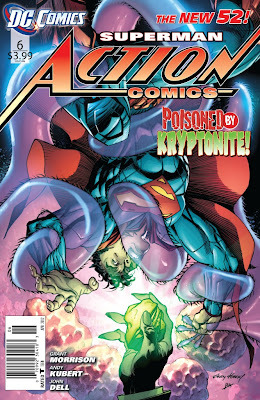 Action Comics #6 - Hmmmm. It's amazing how many properties I really enjoy that involve time-travel. Back to the Future, The Terminator, Star Trek, and....Action Comics???? Actually, scratch that last one. It featured time travel, but I didn't really enjoy it much. This month's issue somewhat confusingly features a Superman from the future fighting to preserve the past by remembering things from the slightly-more-distant past that we never even knew about. Meanwhile, the present-day Superman (who is actually in the past since this whole title is 5 years behind the rest of the New 52. I think. It's hard to figure out...Justice League is such a wild card) is not really in this issue. There's a secondary story about Clark and his parents that I really enjoyed, although the pencils were rough. People will probably hate it but I thought it was nice. It's depressing how many New 52 heroes have dead parents, and it's nice to see some of the interaction between Clark and his parents BEFORE they died, since to me it seemed that they were such an integral part of the morals and values of the pre-reboot Superman. I'm glad that hasn't changed, even if Jonathan and Martha's status amongst the living has. -Intricate and imaginative retelling of the Superman origin and his early days in Metropolis, feeling both familiar and fresh. - I LOVE the T-shirt, Jeans, Combat Boots and Red Cape look of the just-starting-out Superman and can't wait to see how he evolves to the Man of Steel who appears in the Justice League and Superman. - The continuity and time-line for this run of Action Comics is a little muddled and hard to follow, going back and forth in time in Clark's life and now adding time travel on top of it. - Just a personal pet peeve, but I wish the "S" on Superman's cape was still yellow. Black doesn't look as good. Score: 3.5 out of 5 yellow "S" shields! Good work! Detective Comics #6 - This month's Detective continues last month's story, as Batman discovers that the mysterious assassin he was chasing last issue is actually a woman with an eye-patch. he's tracked her to the Iceberg Casino to try and bust up an explosives ring. Meanwhile, Bruce Wayne's "date", Cameron Hampton is an investigative reporter doing undercover research on the Penguin and his Iceberg Lounge . It turns out that the eye-patch wearing female is Jill Hampton, Cameron's sister! With the help of her accomplish, a man named Snakeskin who can change his face at will, she seems to be planning to blow up the lounge! - A grimy and realistic portrayal of the Dark Knight Detective doing what he does best...solving mysteries alone in the night. Great artwork and writing, the most grounded and realistic version of the Bat. - The plot of the last 6 issues has been intriguing and unpredictable, beginning with the Joker's disappearance, with many plot-threads kept open and ongoing. A great balance of right-away satisfaction and long-term storytelling. - The violence and murder in this comic may seem excessive, especially for younger readers. 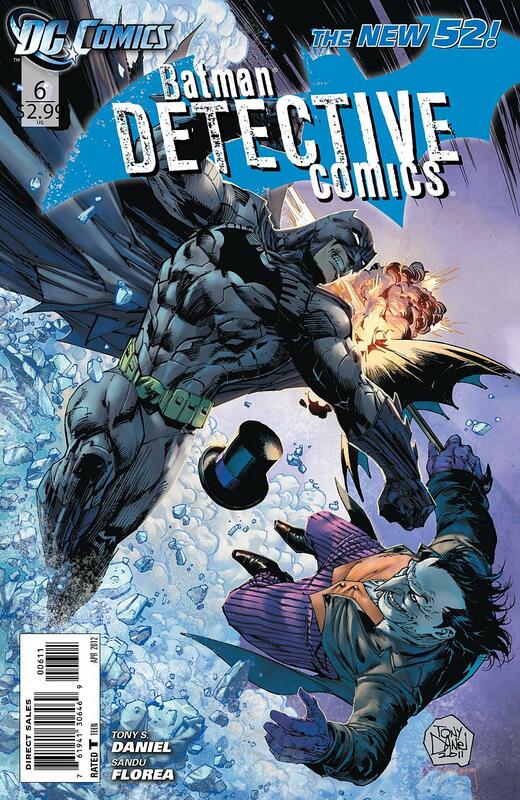 Definitely not the Batman comic you buy for your 8-year old. Score: 4 out of 5 razor-sharp batarangs! Short but sweet this week with only 3 titles! There are 5 Wednesday's in February so perhaps the release schedule is slightly staggered. I could google it but I prefer the suspense. Stay tuned next week for another 6 number 6's, including Green Lantern and Batgirl!! Plus more overall run reviews! Have a good week!